All of these prints were made with linoleum blocks. The figurative images on the top and second rows were created to utilize some reference shots taken of a model around 2003. The thistle image (go to Tyrus's Eye on Art for a description of the print) and the other multi-color images are reduction prints. The blocks for each of these images were successively carved and printed two to five times onto each sheet of paper in the edition. No additional prints can ever be printed with this method because the "first block" or layer no longer exists after the artist begins carving for the second layer. The video below shows some of the carving and printing process for the prints on the top row. 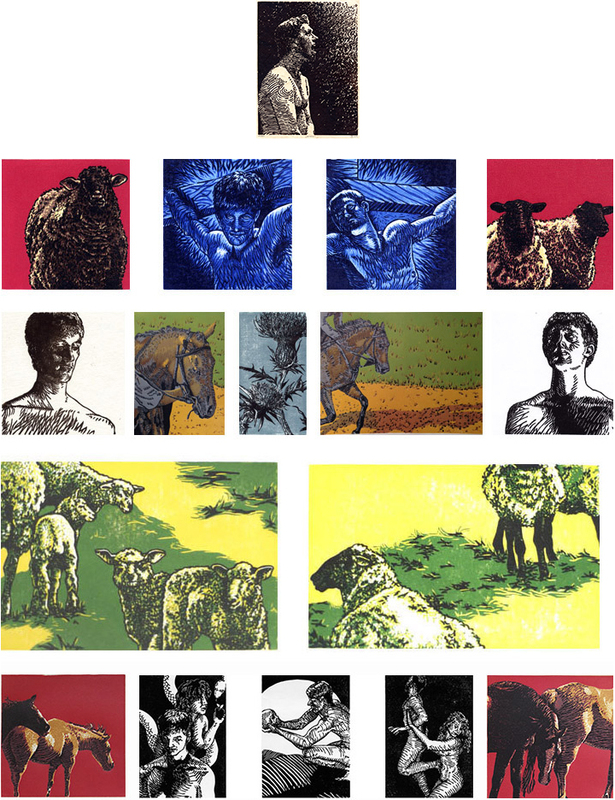 The three black and white linoleum prints on the bottom row were designed as illustrations for the book The Beginning: A Second Look at the First Sin by A.D. Bauer, published by Square Halo Books. Six artists produced images to serve as frontispieces for the chapters of the book.